As a single Dad gamer with daughter, over the years it’s been important for us to track down the very best 2 player board game options. Out of the box, Settlers of Catan is intended for 3-6 players. But, there’s a few options available if you’re looking to play Catan with just 2 players. This version adds extra (not included) chips into the game to help retain the trading element – crucial to the base game’s variety. Crucially, on each turn, a player uses 2 separate rolls of 2 dice, instead of one roll. Neutral building means that each time you build out a road or settlement, one of the 2 dummy players receives that same building also. The additional chips can be used in various functions and extends the trading capacity of the game. A whole different game in it’s own right, it retains a few (and I mean…not a lot) of the mechanisms from the original game, but essentially this is a different beast. Allocating resources, dice rolling etc are all there in the normal way, but there is no board, and only cards instead. The cards of your province will be laid on the table as the game progresses, and cards are rotated anti-clockwise to increase resources with favourable dice rolls, and clockwise to reduce resources when spending/trading. The play area expands outwards as you lay more and more cards out, to form your ‘Province’. Roads and settlements are laid left to right and resources or new locations are laid top and bottom, above and below the roads and settlements. Event cards can upset the gameplay or break the stride of your opponent if played at the right moment. It’s clear to see what aspects of the original game they’re trying to port over to a 2 player version, but it’s not clear what the aim was, by turning it into 100% cards based – more portable? Not sure. The base games plays fine, especially if your already familiar with Catan style of play, and some games we played of the base version can reach conclusion really fast if your partner is playing aggressively for Settlements > Cities right out the gate. My Recommendation – Can you play settlers of catan with two players? I’ve tried all the above variants and for us, to be honest, the main Catan game, with the 2 player official Catan Wiki variant played out best. It retains much of the trading elements of the game which for me is central to the enjoyment of the game – but that’s a personal thing of course. In playing out this version, it allows you to have a copy of the main game, an effective 2 player version, and still have the option to play 3-6 players for family occasions or bigger gaming group. You also have the option to switch out to another 2 player variant if you don’t like one. For us, Rivals is an interesting slant on the original, but doesn’t hold us for the same amount of time and has lower replay value. Somehow it feels more like the designers were going for a portable version of the base game instead of a 2 player variant. So going with the standard base game gets the GTNS seal of approval for this one ? – How can a game designed specifically for kids’ level of play, actually be any good? Welp, they did an *amazing* job on Catan Junior, converting the main game to a kid-friendly version. There are several islands in the game which each generate resources depending on dice rolls. Those resources can then be traded with the market place to build ships, hideouts, and Coco cards (more on this later). Sometimes I feel like I actually have more fun trading goats and cutlasses, than roads and settlements to be honest ? I guess the inherent appeal of all the Catan games is the influence that your trading ability has on the game. Even with this younger version, there’s always a sense that, as the game progresses and differing resources are available at different times, your ability to make the best trades in each situation, has a huge influence on the ultimate outcome. 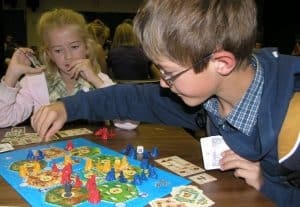 Personally, we enjoy this strategy style of play over dice-rolls or just plain random chance in other games, as your little one can quickly get a sense of how their actions impact on the direction of the game, and importantly, in Catan Junior, the rewards come quickly, so that young minds are kept engaged throughout the game. Catan Junior is recommended for ages 6+, although honestly, we were playing easily from age 4+, with a little help from Dad. On the box the game should take around 30mins, a bit longer than that in our experience, and plays 2-4, although it works great with just 2 from our experience – the game comes with a dedicated map specifically designed for use with 2 players – a refreshing find for games designed for audiences this young. To capture young ones’ imaginations this version admittedly has a more piratey feel to it, but the artwork is fun and cutesy, as opposed to dark or threatening. Kids can learn risk reward relationships by obtaining Coco the parrot cards (my daughter *always* went for these at the first opportunity in our games lol). These cards, the only ones which require gold coins in the game to obtain, can pay off handsomely if Coco bestows a cache of resources at once. Or, he may simply allow you to move the robber around the board, which inevitably draws a groan from all involved lol. A Catan adventure for fledgling swashbucklers. We love it. Rules are more complex here than in younger versions of the game, and allow for more complex trading scenarios, development cards, and bonuses to be earned for e.g. the longest army etc. Setups can be random or players can use the suggested layout to begin with. The roll of the dice still determines resources gathered each turn, but there are more conditions on building, such as ensuring 2 roads minimum between settlements, etc. Trading at ports and with other players still forms a central part of the classic Catan experience, and the genius from the designer Klaus Teuber is in keeping the game active between players, whilst still maintaining the competitive element. This tends to lead to some cunning trades for optimal resources, and you’ll need some guile to convince opponents to trade in your favour. It’s a great mechanic. It’s a race to 10 victory points by accumulating settlements and cities and as the game continues, to turn settlements into cities requires different resources than you were trying to gather initially – another ingenious twist. 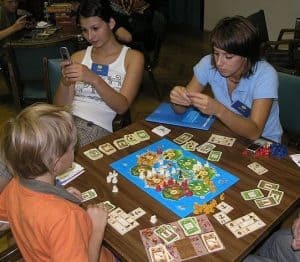 The main Settlers of Catan game is aimed at ages 10+, although can work easily 8+ with some help from parents I would say. 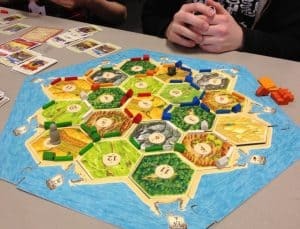 The design is a little more muted than it’s younger counterpart, the colour scheme is the familiar Catan yellows, reds and browns, but with fewer of the brighter primary colour pallettes involved than the younger edition, to keep youngsters attention. In geeky board game circles this original Catan is considered widely to be the “new monopoly” – and deservedly so. Catan is now a staple and has huge replay value. If you have friends or family you’re trying to get into gaming, this is an effective gateway game for them. I highly recommend it. 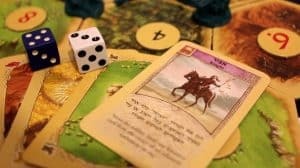 The simplest version of Catan available, that aims to gently introduce the principles of resource collection and basic strategy. 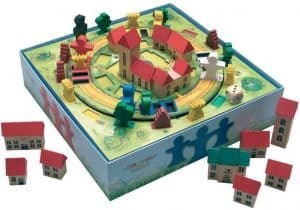 In a plan of the village with wooden blocks suitable for free play, players take turns rolling dice and rotating the village itself to secure resources over time. These resources are then used to construct further buildings within the village. When all of a players’ buildings are complete, they may build the town hall, to win the game. The manufacturer stated age for this is 4+, which is about right. Again I feel even younger is possible with this, with some help, so 3-6 feels about right here. We liked that the physical movement of the board determines resources obtained, it’s a neat mechanism that keeps the attention of young eyes throughout the game, with an element of guessing “where will it stop?”, similar to fairground game experiences. Primary colours everywhere in Kids Of Catan, as you would expect. Components are chunky, and can also be used for play outside the game, a useful addition. Kids of Catan takes about 20 mins to play, and it’s a great place to start the young ones.